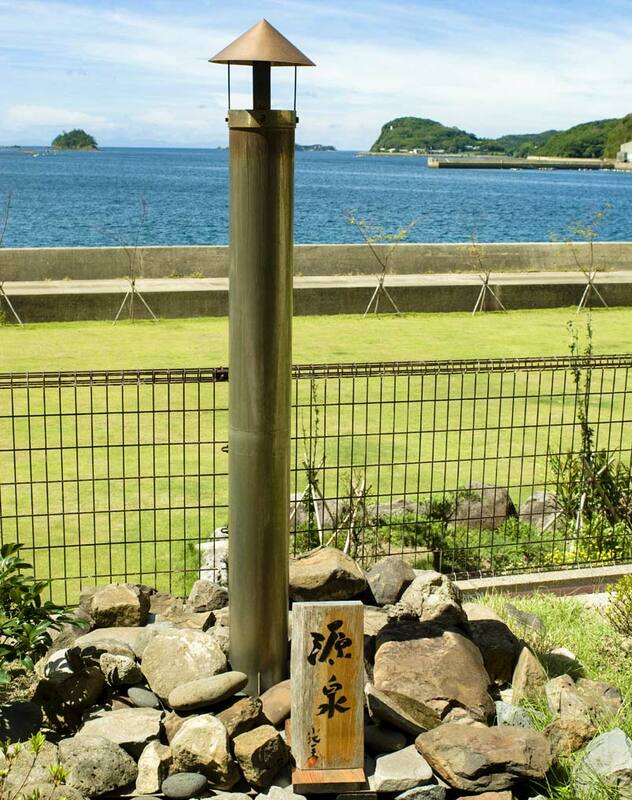 Our hypertonic natural hot spring with hot water straight from its source is one of Iki Island hot springs with a very long history, known and loved for its abundant health benefits and unique properties since 1700 years ago. The sodium chloride hot water changes its color to gold when in contact with the air due to the high content of iron. Hypertonic hot springs such as ours are easily absorbed by the body, compared to other hot springs. This is characteristic to hot springs based on oceanic salinity that has accumulated over a long period of time. Beginners to hot springs are recommend to avoid long periods of soaking until the body adjusts to handling hot water. Cationic components of our hot spring contain abundant magnesium ion and calcium ion in addition to sodium ion, the main component, and act as a sedative to suppress convulsion and inflammation. Our hot spring contains lithium ion in a quantity over 7 times higher than the standard for hot springs, and as a result is said to be effective as a sedative, as well as in stimulating cell activation (fatigue relief). Besides chlorine ion as the main anionic component, the hot spring also contains bicarbonate ion (main component of bicarbonate earth spring, also known as sodium bicarbonate spring) in quantity 1.7 times higher, and metaboric acid over 3 times higher, than the standard value for hot springs. Both components are effective in washing out sebum, making after-bath sensation extraordinarily fresh.